Air traffic flow represents the distribution of air traffic over a region of space. Air traffic is undergoing major changes both in developed and developing countries. The demand for air traffic depends on population growth and other economic factors. Air traffic in the United States is expected to grow to 2 or 3 times the baseline levels of traffic in the next few decades. 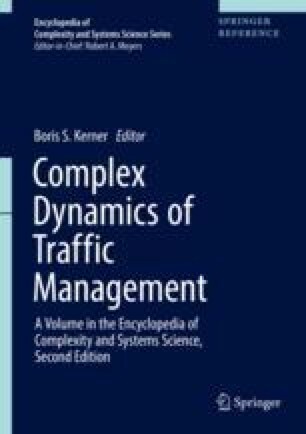 An understanding of the characteristics of the baseline and future flows is essential to design a good traffic flow management strategy. An autonomous driving vehicle is a self-driving vehicle that can move without a driver. Autonomous driving is realized through the use of an automated system in a vehicle: The automated system has control over the vehicle in traffic flow. Autonomous driving vehicle is also called self-driving, automated driving, or automatic driving vehicle. I would like to thank Michael Schreckenberg, Hubert Rehborn, Craig Davis, Ihor Lubashevsky, Sergey Klenov, Micha Koller, Sven-Eric Molzahn, Dominik Wegerle, and Yildirim Dülgar for many useful comments. I thank our partners for their support in the projects “UR:BAN -- Urban Space: User oriented assistance systems and network management” and “MEC-View – Object detection for automated driving based on Mobile Edge Computing,” funded by the German Federal Ministry of Economic Affairs and Energy.